This selfie stick is mainly compatible with various smartphones (iPhones and Androids).These includes phone models such as iPhones (4S, 5, 5S, 6, 6+) and Androids (Samsung Galaxy 3,4,5 Samsung Note 2 and even other popular brands such as Sony, LG and more. You have to make sure that your devices (iPhone or androids) fulfill the minimum requirement of Apple IOS 6.02 or newer and Android 4.2.2 or newer in order for the bluetooth functions to work. Besides, the width of your phone need to be in the range of 2.2 inch to 3.3 inch to fit the adjustable phone holder perfectly. Precaution: Some customers (minority) pointed out that phones that are large and heavy like iPhone 6+ are incompatible with this product because the stick might bend downwards when extended to it's maximum length. Unfortunately, it is not compatible with cameras because it does not have a screw to be attached to the camera. However, if you have a small and thin camera, you can still use the phone holder to grip it (we don't recommend doing so). Extendable selfie stick - Allows you to extend the selfie stick to a maximum length of 34 inches (excluding the handle and phone holder) for great selfies. When not in used, the extended part of the stick can be contracted (to around 7 inches) so it can be brought around easily. 360 degree rotatable phone holder - The phone holder that comes together with this selfie stick is rotatable to allow you to take selfies at various angles to picture yourself in the way you favor most. It allows horizontal and vertical rotation, look at the picture below. Note: The reason why some people don't prefer the button to be on the stick itself (inbuilt-bluetooth system) is because their hand might tremble while pressing the button which makes the picture blur. 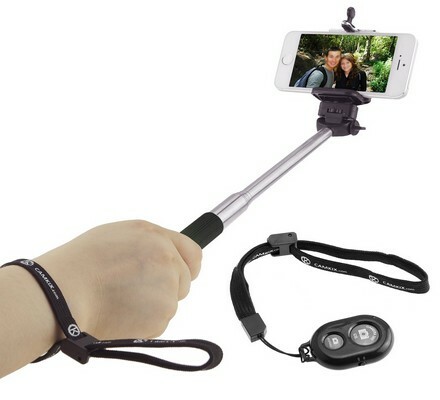 Safety String - There is a safety string connected to the handle of the selfie stick and also the bluetooth shutter. These strings are hanged over your wrist as an extra security measure. The quality control of this product is great. Although there are still customers complaining (very minimum) that the selfie stick broke within a few days, I would consider that the durability and quality control of this product is certainly great. This is because there are only about 6% of customers (calculated based on total review in Amazon) complaining about this issue which means that 94% of customers are satisfied with the product. Precaution: Having that said, this selfie stick when extended to it's maximum length does bend a little downwards when a heavy phone such as iPhone 6+ is attached to the phone holder, which points out that the strength of this product is not that strong. The strength of this product is perfect to support phones of reasonable weight (including iPhone 6). This product has an average rating of 4.6 stars from more than 800 reviews in Amazon. This is great because a large number of customers are extremely satisfied with the product which indirectly acknowledge the quality of the product. Note: The average rating of this product in Amazon is extremely realistic looking that the average rating takes into account a large number of samples (800+ reviews). Based on the customer's review and the product quality, I would say that the rating should resolve around 4.5 stars which is 9/10. The best part is that they are willing to refund you 100% or resend you a brand new selfie stick if you are unhappy with the original one you bought. Besides, they are there with you throughout the process to make sure your issue will be solved as soon as possible. The troublesome part is they do not provide you the email directly, instead you will have to contact them via their account in Amazon. This may turn out to be complicated for some customers. Also, I would like to show you where to contact their customers service in the screenshot below. This selfie stick comes in 3 different colors - Black, Pink, Green. The colors look really beautiful and clean. Besides, the pink and green colors (as shown in the picture below) are really beautiful colors. These are the trending colors that most people favor. 1) No charging required. The bluetooth shutter works with batteries. This makes it suitable for long distance traveling as you do not need to charge the bluetooth shutter frequently (the shelf life of batteries are really long). 2) Complete manuals with detailed instructions. This product comes with a complete manuals where all the steps needed to operate the selfie stick are stated clearly. The setback. The main disadvantage of using a bluetooth shutter is that, you will need to carry two objects (the selfie stick and the bluetooth shutter) while traveling. Sometimes, it is can be really annoying to bring around these two objects. However, they are really light and compact whereby you can keep them in your backpack. This selfie stick product has a recommendation level of 5/5 (extrememly recommended). This product is certainly worth the buy. Besides having lots of advantages - high durability, great choices of colors, good customer's support, feature-rich product - it only costs you $24.99, which is really reasonable. Having all these said, the strength of this product is weaker compared to those really great selfie sticks (which will cost you anywhere around $35 and above). You are welcome 😀 Hope the reveal helps.